I brought these little cuties home from the farmers market last weekend. 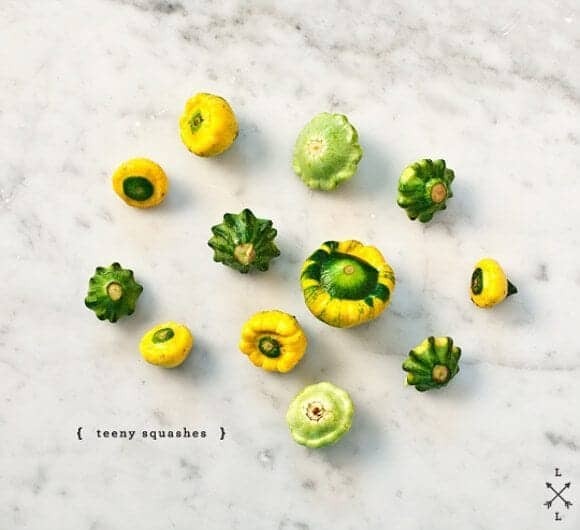 If you’ve been following, you might have noticed that I have a little obsesssion for all things mini, so I just couldn’t resist the these teeny tiny patty pan squashes. I’m going to chalk it up to the heat, but I’ve been spacey lately. When I was ready to start cooking, I stood in my kitchen and realized the only thing I had intentionally planned to go with my sautée of mini squashes were some chives. 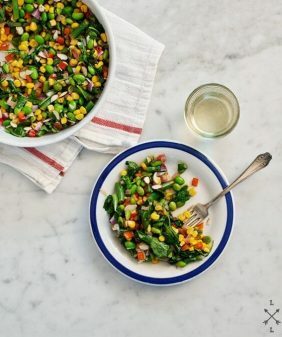 I mean, there’s something to be said for turning vegetarian “sides” into full meals… but chives are maybe not the most filling way to achieve that. At first glance, my near-empty fridge offered no help. Then this gorgeous recipe of Aida’s popped into my mind, and I realized I had enough to make something similar. I ended up changing a few things according to what I had (or rather, didn’t have) on hand, and also took a slightly more summery spin. 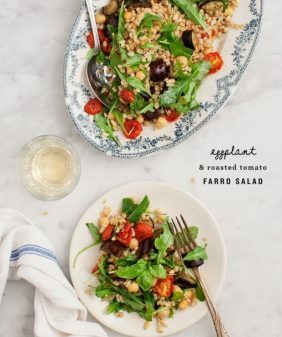 (Her story with the recipe was about a blustery day in San Francisco — and it sure is/was/will-seemingly-always-be 105 degrees here). Click here to go to her site for the full recipe. Bring a large pot of salted water to a boil. 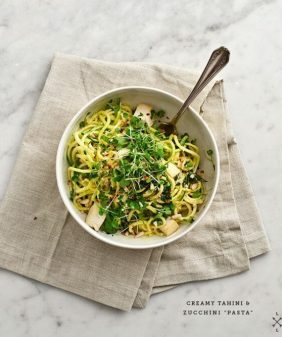 Cook the orzo until al dente, referring to your package for exact cooking times. Drain, reserving ½ cup cooking water, and set aside. Make the squash sauté: Heat the olive oil in a large skillet over medium heat. Add the onion and cook, stirring occasionally, until softened, 5 to 7 minutes. Stir in the garlic and summer squash and a splash of white wine. Continue cooking until the wine reduces and the squash softens. Stir in the corn. Taste and adjust seasonings. Raise the heat to medium-high and add the reserved pasta water. 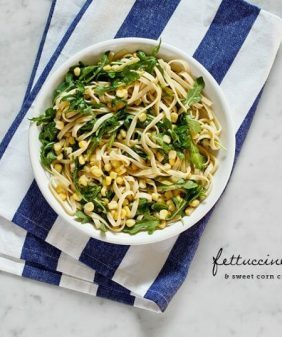 Stir in the orzo and mix until the vegetables and pasta are well combined. Add the basil, pine nuts, chives, and red pepper flakes. Taste and adjust seasonings, topping with the feta, parmesan, sun-dried tomatoes, and/or balsamic, if desired. I love all of your recipes and would like to start using locally grown produce. but Im not sure where to go! I lice in Austin in well and was wondering where you go? Which farmers market do you like best? The SFC farmers markets have a few times/locations: (www.sfcfarmersmarket.org) I go to the Saturday one downtown because it’s closest to me, but I *think* most of the same farmers show up at each. Or if we’re not up and out early enough on Saturday mornings, we also like the Hope farmers market on Sunday afternoons (www.hopefarmersmarket.org). I especially love the produce from Johnson’s Backyard Garden (it’s the biggest tent, you can’t miss it), and they have a stand at all of the farmers markets (www.jbgorganic.com). You can buy produce separately or join their CSA which has more pickup & delivery options. Hooray for teeny weeny squashes! I never know what to do with these little guys–thanks for the great idea! Love the combination of flavors with the feta and basil kick! 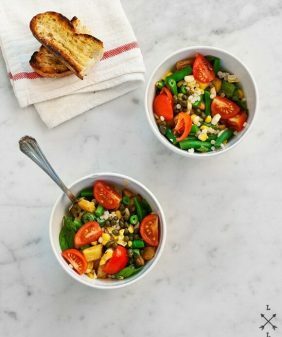 Beautiful summer recipe. 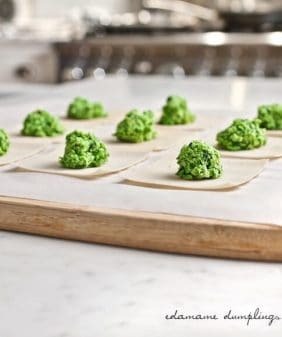 Beautiful photos and a delicious recipe! Oh what a symphony of textures! 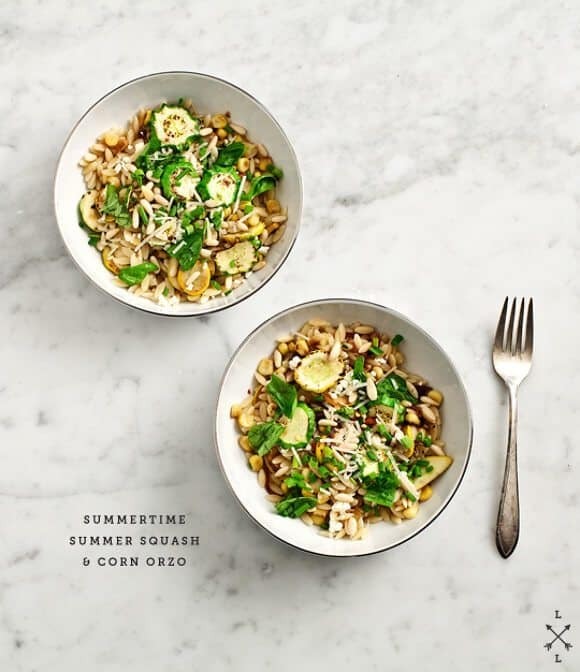 I can just feel the explosion of the sweet corn next to the soft bite of the orzo and pine nuts, then everything swimming in the sunny flavors of sauteed squash. You are making my day right now! I’ll see if I can find some minis at my Farmer’s Market this weekend! I love all things mini, too! Especially gorgeous little squash minis! Just found your blog through pinterest! Love it and this dish, too! I could not stop eating this last night, Jeanine! Sounds delish! Will have to try soon!